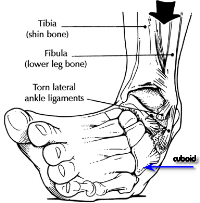 This condition, also known as a subluxed cuboid is a disruption of the cuboid bone which lies on the outside of the foot, in its alignment with the adjacent bones. The disruption of this bone causes irritation to the surrounding soft tissue structures that attach to it. This is a condition seen more often in athletes due to the excessive pressure and motion that they put their feet through. It is thought that the most common cause of a subluxed cuboid is due to excessive inversion of the ankle (see drawing, below right) or excessive plantarflexion of the foot. Certain athletes are seen at greater risk of developing this syndrome. Male ballet dancers are very prone to this injury due to repetitive jumps, while female ballet dancers are prone to a subluxed cuboid as a result of the second most cause of this condition, overuse injuries, where there is a repetitive microtrauma to the ligaments attaching to the cuboid bone. running on uneven surfaces, particularly banked streets where the foot is forced into supination. On a banked street this would involve the foot that is further from the center of the street (closer to the curb). excessive weight, like most foot problems, too much body weight puts excessive strain on the feet and ankles. worn out athletic shoes, shoes that do not adequately support the foot can aggravate this problem. feet that exhibit too much motion at the level of the subtalar joint which creates excessive inversion or everstion. The diagnosis cannot be made by use of x-ray or MRI because the subluxation is so minor that imaging studies would be of little value, however at least an x-ray is indicated to rule out other pathology particularly fracture. Many doctors advocate the use of a CT scan (computerized tomography) when investigating the possibility of a fracture of the cuboid as it seems a CT scan better outlines the cortex (outer layer of bone) than an MRI or x-ray. Quite often this condition may be confused with peroneal tendonitis and fifth metatarsal base fractures. the primary treatment is manipulation of the cuboid bone back into place. In many instances relief from pain is immediate. taping the foot in a certain manner to force the cuboid back into position. This can be accomplished through low-dye strapping or KT taping. in cases of simple non-displaced fractures where there is essentially a crack in the bone but no separation of the two ends of the bone, initial treatment consists of immobilization with non-weightbearing. I recommend non-weightbearing simply because when bearing weight, the pressure exerted on the outside of the foot, even in a cast, can be enough to not allow the fracture to heal. A bone stimulator may also be used to aid in healing. In cases where immobilization does not remedy the situation surgery may be indicated. 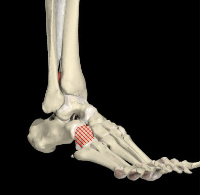 In simple cuboid fractures, in many instances a bone fusion is performed between the calcaneus (the bone behind the cuboid) and the cuboid bone itself. This fusion creates better stabilization of the cuboid bone thus reducing pain. In cases of cuboid fracture from trauma, the bone itself may require insertion of hardware to stabilize it as well as fusion to the calcaneus.